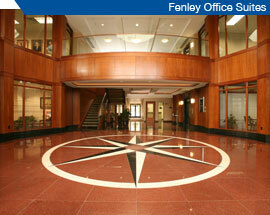 (Louisville, KY) Fenley Real Estate, a Louisville firm with one of the largest portfolios of Class A office space in the state, is planning to carve up part of one of its buildings and create executive office suites. Plans call for the company to take about 16,000 square feet of vacant space on the first floor of the two-story, 45,000-square-foot Fenley Office Park II building and redevelop it into 57 Class A offices and two full-service executive boardrooms. 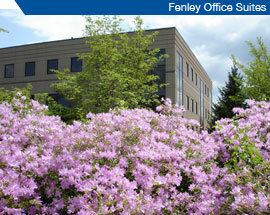 The building, located at 4965 U.S. 42, is part of the three-building Fenley Office Park complex. Built in 1995, it also is known as the KMA Building for the Kentucky Medical Association, which is the anchor tenant. Work is under way on the build out, which will include the complete demolition and reconfiguration of the interior space, according to Ginger Whelan, an assistant to Fenley Real Estate President David Fenley. Fenley was unavailable for comment before Business First's press deadline. Whelan said the executive office space should be finished by June 1. The total redevelopment costs have not been determined. The executive offices will be called Fenley Brownsboro Suites, and tenants will have access to shared office equipment, conference rooms and professional support staff. The suites complex also will offer "virtual offices," allowing clients who don't need physical space to use meeting rooms, receive mail and have a telephone line answered by a receptionist with their company name. Costs for the suites begin at $500 a month, including all amenities. The executive office suite arrangement is ideal for large corporations with local satellite offices and for small-business owners who don't want to work out of their homes, Whelan said. She added that she expects demand to be high for the offices, noting that the company already has received several inquiries without actively marketing the space. 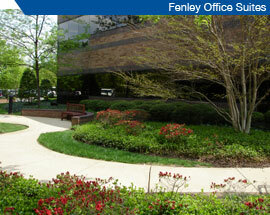 Fenley Real Estate also owns and operates Fenley Office Suites, which houses 72 units, conference rooms, meeting space and training facilities, at its Corporate Campus complex in the Hurstbourne Green business park. Those suites have proven to be popular, particularly for financial planners and mortgage brokers, Whelan said. Only five currently are available.